The DASH2 is one of Race Technology’s most popular products. Housed in a sealed die-cast case, the DASH2 can be used either standalone or with our range of ECU interfaces and data logging products. It is fully road legal, but also used extensively in race applications. When used in standalone mode, the DASH2 can connect to four sensor inputs, for example water temperature, oil pressure, fuel level and boost pressure. These sensors can be from Race Technology, or almost any 3rd party sensor. It also has inputs for RPM, speed, non-resettable odometer and warning lights for full road legal operation. When connected to an ECU using one of our interfaces, the DASH2 can display any of the channels output by the ECU. The channels depend on the ECU model, but normally include throttle position, boot pressure, exhaust lambda, air temperature etc. 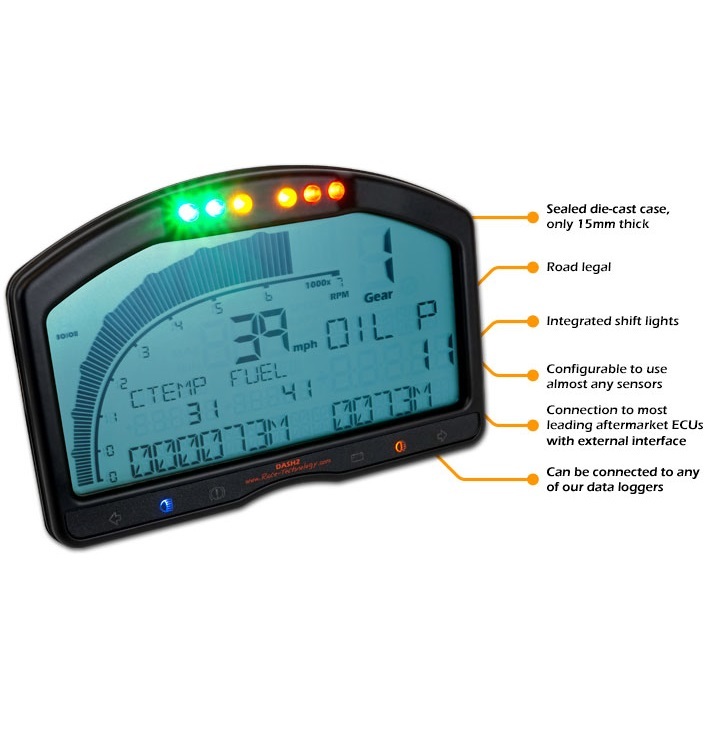 When the DASH2 is connected to one of our data loggers, it can be further configured to display many more parameters including real time lap and sector times calculated from GPS data, any available analogue measurements (e.g. temperatures and pressures), RPM, wheel/shaft speeds etc. The actual data displayed can be set up for the user’s specific requirements. You can also set independent alarms for all channels. High contrast, high visibility custom LCD display with EL backlight. Make Enquiry For Product "DASH2"